A new Cochrane Review published in the Cochrane Library has found evidence from randomized trials that taking an oral vitamin D supplement in addition to standard asthma medication is likely to reduce severe asthma attacks. Low blood levels of vitamin D have been linked to increased risk of asthma attacks in children and adults with asthma. There has been a growing interest in the potential role of vitamin D in asthma management, because it might help to reduce upper respiratory infections (such as the common cold) that can lead to exacerbations of asthma. Several clinical trials have tested whether taking vitamin D as a supplement has an effect on asthma attacks, symptoms, and lung function in children and adults with asthma. The team of Cochrane researchers found seven trials involving 435 children and two studies, involving 658 adults. The study participants were ethnically diverse, reflecting the broad range of global geographic settings, involving Canada, India, Japan, Poland, the UK, and the US. The majority of people recruited to the studies had mild to moderate asthma, and a minority had severe asthma. 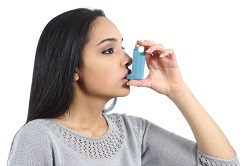 Most people continued to take their usual asthma medication while participating in the studies. The studies lasted for between six and 12 months. The findings of this Cochrane Review are to be presented at the European Respiratory Society (ERS) Congress in London today.